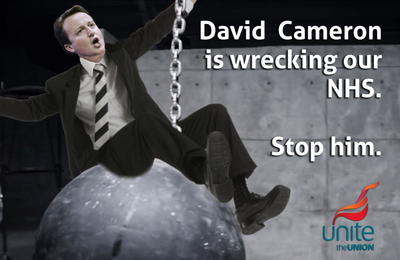 David Cameron is wrecking our NHS – Unite’s hard hitting digital campaign launched today (Monday 3 March) warns of the government’s latest assault on our NHS which could see hospitals shut in as little as 40 days. Clause 118 (now 119) of the Care bill will allow for the privatisation or fast-track, financially driven closure of hospitals, in as little as 40 days, at the whim of Westminster bureaucrats, without any proper consultation. Dubbed the hospital closure clause, clause 119 of the Care bill is being rushed through parliament by the Conservatives in the wake of Jeremy Hunt’s defeat by the people of Lewisham in his bid to close their successful and solvent local hospital to bail out a nearby trust. MPs are set to vote on clause 119 next week, (10-11 March). That doesn’t give us long to stop this undemocratic power grab becoming law. Remember they work for you – email your MP. Unite has made it easy. Please click here and enter your details and click submit. Should the closure clause be passed by MPs clinical input into the decision making process will all but disappear. Reconfiguring NHS services can produce outstanding results. The London Stroke Plan hailed by politicians as an example of exemplary working across organisational boundaries has greatly improved clinical outcomes. It took many months of comprehensive consultation to make work, not 40 days. With one in five hospitals drowning in debt, dozens of hospitals could be at risk of closure or ripe for takeover by profit-driven healthcare companies on financial grounds alone, regardless of clinical need. This entry was posted in Activities and tagged Clause 118 (now 119) of the Care bill, David Cameron is wrecking our NHS, Unite the Union by tamesidegreens. Bookmark the permalink.